After too long in the making, here at last is the release of my latest Regency romance novel, The World’s a Stage! All the world’s a stage for Peter Barton, a wandering actor now posing as a gentleman in Regency high society. But his carefree existence is jeopardized when a matchmaking mama tries to snare him for her dowdy daughter. To avoid entanglement and exposure, Peter needs a mistress – or at least someone willing to play the part. The stage is no place for a lady, but when proper young lady Amy Greenlow is left destitute with a young sister to support, she dares to reinvent herself as the actress “Amadora” and takes the London stage by storm. But all Society knows that actresses are women of no virtue, and a ruthless Marquis is determined to make Amadora his latest mistress and won’t take no for an answer. To discourage his advances, Amy agrees to play another part, that of Peter Barton’s mistress. So there you have it! 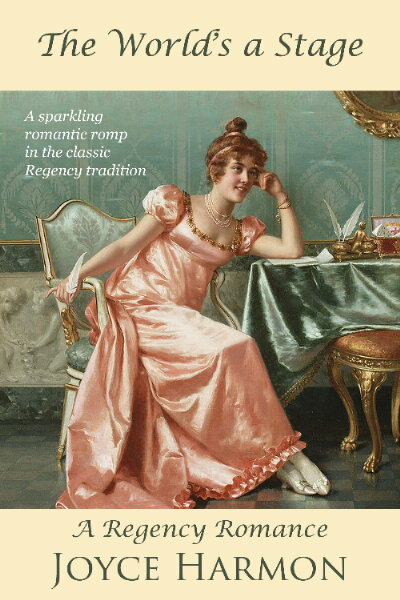 We’re all caught up on new releases and I hope you’ll be glad to know that the next Regency is already in the works.